Photo: Woodlands Plantation House, ca. 1840, U.S. Route 84, Gosport, AL. Listed on the National Register of Historic Places in 1980. Photographed by User:Altairisfar (Jeffrey Reed, own work), 2011, [cc0-by-1.0 (creativecommons.org/publicdomain/zero/1.0/deed.en], via Wikimedia Commons, accessed April, 2014. Clarke County administrative offices are located at 114 Court Street, Grove Hill AL 36451; phone: 251-275-3507. Clarke County is a rural county located in the piney woods of southwest Alabama. It was initially explored during the French colonial period and probably began to be settled by whites in the late 1700s. Its geography and location predicted that it would be a county of small to medium farms interspersed between vast forests of pine and hardwoods. Despite its location between the Alabama and Tombigbee Rivers, the county remained relatively isolated until the coming of the railroad in the late 1880s. Its isolation was further broken by the improvement of its roads and the development of a state highway system from the 1920s through the 1940s. With improved transportation networks, the county gradually became industrialized, but remains rural down to today. A significant change, however, is that much of the county's historic agricultural lands are now timber lands. Originally, Clarke County was part of Washington County which was established in 1800. Clarke County was formed in 1812. Sections of Monroe and Wilcox Counties were added to Clarke over the years until, in early 1831, the county essentially acquired its present configuration. The county is located in the Coastal Plain which is marked by low elevations. In the Coastal Plain, most of the land is below 500 feet above sea level with more than fifty percent of the land being below 100 feet above sea level. Furthermore, Clarke County lies within the longleaf pine belt, one of the largest land divisions in the South Atlantic states. Longleaf pine does not grow in swamps, prairies or alluvial soils. It thrives in orange, sandy soil. This soil type is not very fertile but responds well to fertilizers and is easy to cultivate. The bottom lands found along the rivers and the creeks of Clarke County are as fertile as any land in the cotton belt. Along the Alabama and Tombigbee Rivers the bottoms average a mile wide and are subject to flooding. 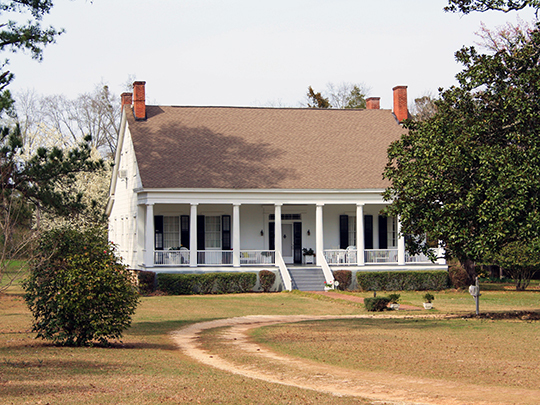 Enzweiler, Susan M., Alabama Historical Commission, Historical and Architectural Properties of Clarke County Alabama, nomination document, 1997, National Park Service, National Register of Historic Places, Washington, D.C.